What always stands out in online and newspaper Ads for amplifiers, stereo, and home theater receivers, is the watts-per-channel (WPC) rating. One receiver has 50 Watts-Per-Channel (WPC), another has 75, and yet another has 100. More watts the better right? Not Necessarily. Most think more watts means more volume. An amplifier with 100 WPC is twice as loud as 50 WPC, right? Not exactly. 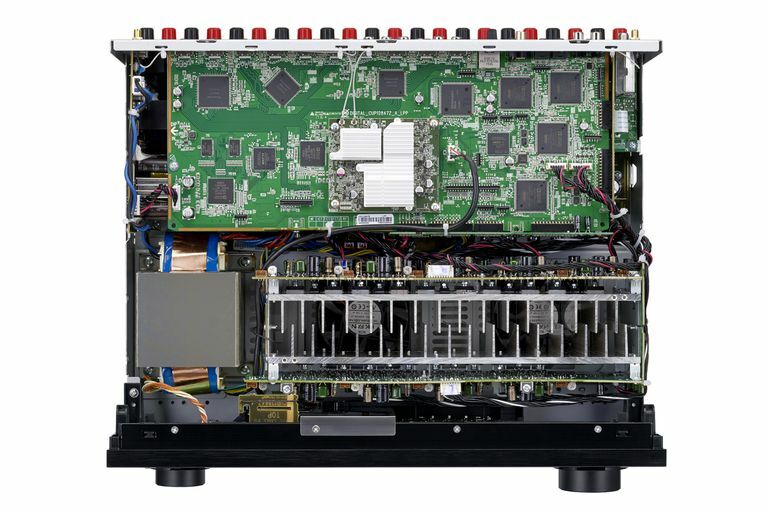 When it comes to real amplifier power output, especially with surround sound receivers, you can't take a manufacturer's amplifier power rating statements at face value. You need to look closer at what they are basing their statements on. For example, for home theater receivers that have a 5.1 or 7.1 channel configuration, is the stated wattage output specification determined when the amplifier is driving just one or two channels at a time or is the specification determined when all channels are driven simultaneously? In addition, was the measurement made using a 1 kHz test tone, or with 20Hz to 20KHz test tones? When you see an amplifier wattage rating of 100 watts-per-channel at 1 kHz (which is considered the standard mid-frequency reference) with one channel driven, the real-world wattage output when all 5 or 7 channels are operating at the same time across all frequencies will be lower, possibly as much as 30 or 40% lower. It's better to base the measurement with two channels driven, and, instead of using a 1kHz tone, use 20Hz to 20kHz tones, which represents the widest frequency range that a human may hear. However, that still doesn't take into account the amplifier's power output capability when all channels are driven. In a home theater receiver, not all channels require the same power at the same time. Variations in audio content affect the requirements for each channel at any given time. For example, a movie soundtrack will have sections where only the front channels may be required to output significant power, while the surround channels may output less power for ambient sounds. On the other hand, the surround channels may need to output a lot of power for explosions or crashes, but the front channels may be de-emphasized at the same time. Based on those conditions, a power specification rating phrased in context is more practical to real-world conditions. One example would be 80 watts-per-channel, measured from 20Hz to 20kHz, 2-channels driven, 8 ohms, .09% THD. What all the above techie terms mean is that the amplifier, stereo, or home theater receiver has the ability to output 80-WPC using test tones over the entire range of human hearing, when two channels are operating with standard 8-ohm speakers. This is more than enough for average size living room. Also included in our example is the notation that the resulting distortion (referred to a THD or total harmonic distortion) is only .09%. This represents a very clean sound output (more on THD later in this article). Another factor to consider is whether a receiver or amplifier can output its full power continuously. Just because a receiver/amplifier may be listed as being able to output 100 WPC, doesn't mean it can do so for any significant length of time. When checking amplifier specifications, see if the WPC output is measured in RMS or FTC terms, and not terms such as Peak or Maximum Power. Sound levels are measured in Decibels (dB). Our ears detect differences in volume level in a non-linear fashion. Ears become less sensitive to sound as it increases. Decibels are a logarithmic scale of relative loudness. A difference of approximately 1 dB is the minimum perceptible change in volume, 3 dB is a moderate change in volume, and about 10 dB is an approximate perceived doubling of volume. For one amplifier to produce sound twice as loud as another in decibels, you need 10 times more wattage output. An amplifier rated at 100 WPC is capable of twice the volume level of a 10 WPC amp, an amplifier rated at 100 WPC needs to be 1,000 WPC to be twice as loud. This follows the logarithmic scale mentioned above. The quality of the amplifier isn't just reflected in wattage output and how loud it gets. An amplifier that exhibits excessive noise or distortion at loud volume levels can be unlistenable. You are better off with an amplifier of about 50 WPC that has a low distortion level than a more powerful amplifier with high distortion levels. However, when comparing distortion ratings between amplifiers or home theater receivers, things can get "cloudy". On its spec sheet, "amplifier or receiver A" might have a stated distortion rating of .01% at 100 watts of output, while "amplifier or receiver B" might have a listed distortion rating of 1% at 150 watts of output. You might assume that "amplifier/receiver A" might be the better receiver, but you have to consider that the distortion ratings of the two receivers were not stated for the same power output. It may be that both receivers might have the same (or close) distortion ratings when both are running at 100 watts output, or when "A" was driven to output 150 watts, it might have the same (or worse) distortion rating as "B". On the other hand, if an amplifier has a distortion rating of 1% at 100 watts and another has a distortion rating of only .01% at 100 watts, then it is more obvious that the amplifier or receiver with the .01% distortion rating is the better unit with regards to that specification. As a final example, an amplifier or receiver that has a stated distortion rating of 10% at 100 watts, would be unlistenable at that power output level. It may be possible is more listenable, with less distortion, at a lower power output level. However, if you run into any amplifier or receiver that lists a 10% distortion level (or any distortion level higher than 1%) for its stated power output. would, steer clear, or to try to get some additional clarification from the manufacturer before buying. Distortion specifications are expressed by the term THD (Total Harmonic Distortion). Another factor that affects amplifier quality is Signal-To-Noise Ratio (S/N). This is a ratio of sound to background noise. The larger the ratio, the more the desirable sounds (music, voice, effects) are separated from acoustical effects and background noise. In amplifier specifications, S/N ratios are expressed in decibels. An S/N ratio of 70db is much more desirable than an S/N ratio of 50db. Last (for the purposes of this discussion) is the ability of an receiver/amplifier to output power at a significantly higher level for short periods to accommodate musical peaks or extreme sound effects in films. This is very important in home theater applications, where extreme changes in volume and loudness occur during the course of a film. This specification is expressed as Dynamic Headroom. Dynamic Headroom is measured in decibels. If a receiver/amplifier has the ability to double is power output for a brief period to accommodate the conditions described above, it would have a Dynamic Headroom of 3db. When shopping for a receiver/amplifier, be wary of wattage output specifications and also take stock of other factors such as Total Harmonic Distortion (THD), Signal-To-Noise Ratio (S/N), Dynamic Headroom, and also the efficiency and sensitivity of the speakers you are using. An amplifier or receiver, although the centerpiece your audio or home theater system, other components such as Input devices (CD, Turntable, Cassette, DVD, Blu-ray etc...) are also linked in the chain. You may have the best components available, but if your receiver or amplifier isn't up to the task, your listening experience will suffer. Although each specification contributes to the ultimate performance capability of the receiver or amplifier, it is important to emphasize that a single spec, taken out of context with other factors does not give you an accurate picture on how your home theater system will perform. Also, although it is important to understand the terminology that is thrown at you by the Ad or salesperson, don't let the numbers overwhelm you. Bases your final buying decision on what you hear with your own ears, and in your own room.